The whole Sims franchise is like a well-oiled juggernaut of simmish addiction, at least for those of us who play. Every new version of the game launches with a very small set of features compared to the mature (and much-expanded) version it’s replacing, and then feeds us expansions and stuff packs several times a year to keep our enthusiasm whetted and our wallets empty. Or maybe it’s just me. I didn’t play the Sims 1 or 2 very much at all, but 3 hooked me at launch in 2009 and is the single-player game I go back to the most frequently. Or was, since it’s now been replaced by the Sims 4. Which launched its first expansion — Get To Work — this week. I haven’t had a chance to explore absolutely everything or even a small fraction of everything, and if you want that kind of coverage you’re probably already reading Carl’s site. (I can’t imagine being a Sims player and not knowing that place. It’s like being a WoW player and not knowing WoWHead.) But what I have tried out is surprisingly fun, even if the novelty is likely to wear off in about 6 months… Just in time for the next expansion. Like I said, well-oiled machine. All I’ve tried so far is the Detective career, which is pretty much like any procedural you’ve ever watched on TV complete with clue analysis, crime map, and good-cop / bad-cop suspect interrogations. It’s fun. It won’t be fun forever, but it beats watching the clock roll round while you wait for your Sims to emerge from their career rabbit-holes. 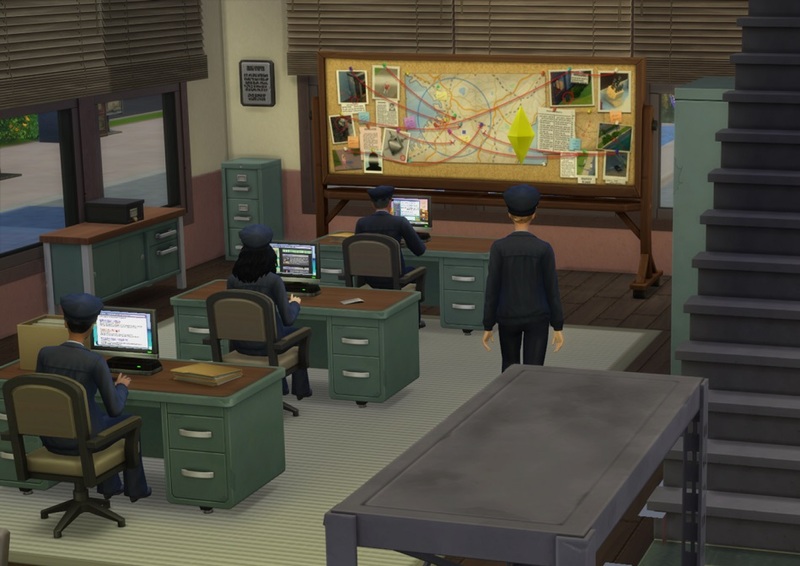 The only thing that worries me a bit is that there appears to be almost no career progress when you don’t accompany your Sim to their ‘active career’, but I guess that’s the downside to what appears to be slightly quicker progression than the standard ‘vanish off to work’ careers. Given that I tried what I thought would be the least fun career first (the new ones are Detective, Doctor and Scientist) I’m hopeful the other two will be quite entertaining and perhaps a little less repetitive. The major problem with the detective career is that it’s not exactly demanding of the little grey cells, at least as far as the player is concerned. But then again, the Sims was never conceived to be demanding in that particular sense. The other thing I’m trying out is Retail, where you can open (or buy) a store and sell pretty much anything you can think of that’s buyable in the game. Old Sims 2 players apparently really missed that feature, and I can see how it would be fun, but I haven’t been able to do much with it yet. It requires a fairly sizeable cash investment even if you’re building your own store rather than buying an existing one, and if you don’t use cheats (which I could have, I suppose, but it didn’t occur to me in this case) it takes a while to build up that kind of money. And it really makes the expansion earn its title, because one of your Sims has to be in the store to manage it when it’s open, so my current household of two roomies who each have a ‘real’ job have been spending their weekends at the store, wondering what happened to their already-precious free time. My wannabe retail mogul is Yvana Trumpe, because Yvana Sellyoustuff seemed a bit tacky. There she is eating one of the first meals she ever made, which looks disturbingly like Soylent Green. 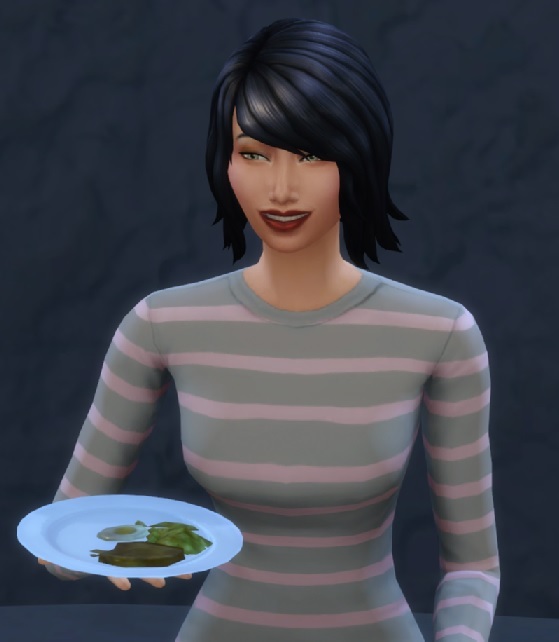 She’s also an author, but her real aspiration is to have a pool filled with Simoleons that she can bathe in. That’s on hold for a bit (I’d forgotten Sims can change their aspirations whenever they want if you’re not playing under the Legacy rules), but it’ll be back. Someday that store will make money, and Yvana will have an army of children lackeys to run the store for her while she bathes in bills.